I bet some of you 1L's out there won't even recognize the term MPRE... I know I had no idea what it was until like my 2L year. Turns out, it is something you have to take and pass in almost every state in order to sit for the Bar exam. I am posting this to help others know and understand the MPRE before it's upon you. It has been a while since I took the MPRE but I hope this overview helps those of your out there wondering exactly what the MPRE is and how to prepare to pass it. 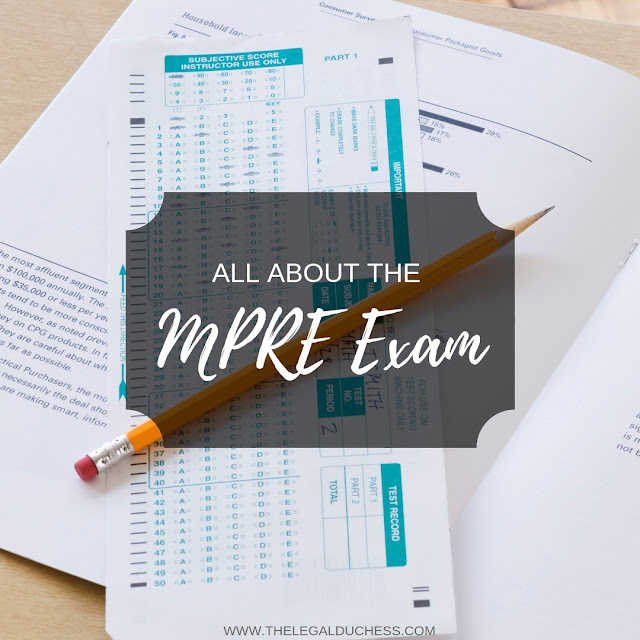 The MPRE (Multistate Professional Responsibility Examination) is a 120-minute, 60-question, multiple-choice examination designed to measure the knowledge and understanding of the Rules of Professional Conduct for lawyers... aka Legal Ethics. 10 of the 60 questions will be test questions (ungraded) and you have to score a certain scaled score in order to sit for the bar in your state. Each state has a different passing score. I am taking the Bar in Ohio and I needed a scaled score of 85 to sit for the bar. The MPRE exam is administered by LSAC (the same people who put on the LSAT) and the process is rather similar to the LSAT overall. It is offered in March, August, and November each year. You can take it multiple times to get the score you need to pass. You sign up for the MPRE on the NCBE (National Conference of Bar Examiners) website. Then, it will transfer you to the LSAC website to finish the registration. How do you Study for the MPRE? Most schools encourage you to take a Legal Ethics or Professional Responsibility course before sitting for the MPRE but you do not have to. I took and passed Legal Ethics (my professor actually drafted the Rules of Professional Conduct... she is a super genius) before I sat for the MPRE and I think it was very helpful to have a strong basis understanding of the Rules of Professional Conduct for the exam. Additionally, I think it is really helpful to utilize a commercial MPRE prep course. Most of the Bar prep companies (Themis, Barbri, Kaplan) offer them for free for the MPRE as a sample of their Bar course. Personally, I used Themis and I was very pleased with it- and it's 100% FREE. The course was very straightforward, the videos were entertaining and short, and I felt very prepared for the exam. I completed the full Themis course and I got a passing score high enough to take the Bar in any state. I followed the recommended course schedule from Themis and just did a little bit each day. I supplemented that by going over my outline from my Legal Ethics class. My advice would be to take the August MPRE before your 3L year if you can. That way you are not trying to do the MPRE on top of semester classes. How is the MPRE administered? Like the LSAT, the MPRE is generally offered on a Saturday morning. My MPRE was offered at my law school on a Saturday and it started around 9:00am. They held it in the auditorium which is always freezing so I dressed in comfy layers for the exam. It is shorter than the LSAT and completed in one sitting so the process was much easier and less stressful. I would suggest arriving early and having a good breakfast before the exam. 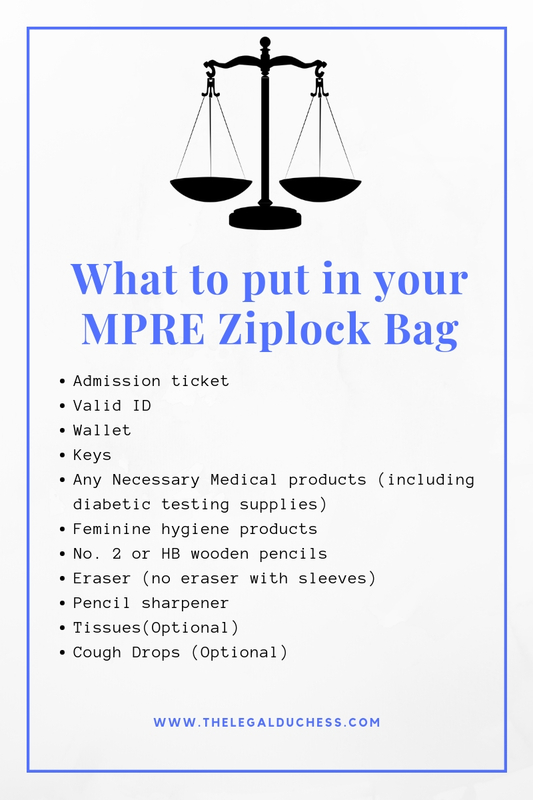 What do you need to bring to the MPRE? Good luck on the MPRE! I had never heard of this exam! I'm so happy I looked at your blog today.